In the last post, we have focused on editable Vector Layers in Pro version and in this one I would like to write more about antialiasing and full-screen mode. What is aliasing and antialiasing? Aliasing in computer graphics is the process by which smooth curves and lines become jagged because the resolution of the graphics device is not high enough to represent a smooth curve. An example of aliasing is the Moiré pattern which due to visual interference and low sampling creates pixelized image. Antialiasing techniques can reduce the effect of aliasing, makes the picture smoother and removes this pattern. In the first version of Flame Painter I used Normal Antialiasing technique to smooth a jagged lines and strokes, but when you wanted to create a high resolution smooth strokes, some moire interference still remained. There are many different antialiasing techniques out there, but most of them are very slow and not suitable for flame multisampling renderer. Finally I developed my own antialiasing technique, which is very fast and accurate, and called it Supersmooth Antialiasing (SSAA). The results is fantastic - very smooth, soft stroke suitable for prints or professional digital media. We implemented it into Pro version of Flame Painter. With the new full screen mode you can move all the panels and tabs on a side, and focus only on the art. It is wonderful for presentations or when you need only clean canvas, creativity and silence (or music). We added also a new option to turn off mouse cursor and brush stroke dots, so you can fully enjoy the creative moment. 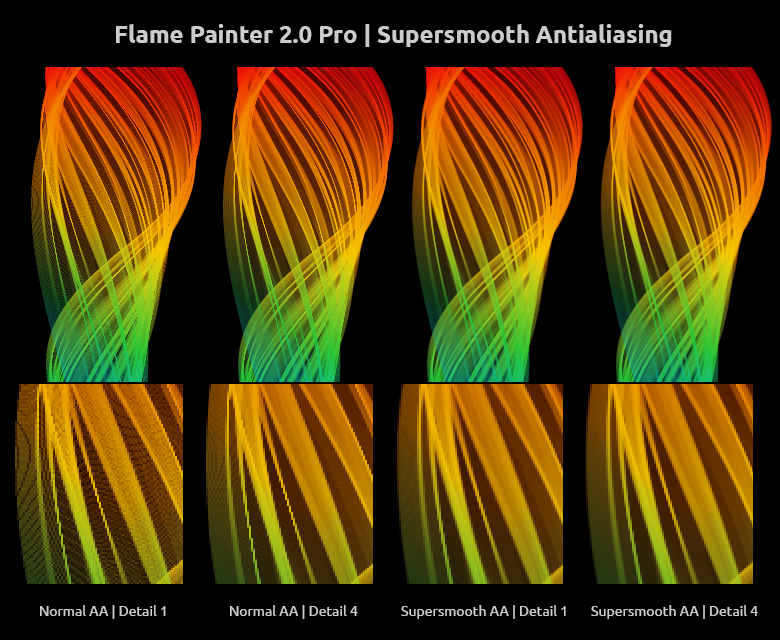 This is the last blog on the key features of Flame Painter 2.0. We hope you will like them as much as we do. The big day is coming - 21st May is the birthday of the new version. We cannot wait to hear your opinion when exploring it.